Recently fired coach Zach Keene and athletic director Marc Keller spoke before a crowd of about 50 of Keene's supporters Monday night. JAY — Supporters of fired Spruce Mountain varsity girls basketball coach Zach Keene demanded he be reinstated by administrators at a public meeting on Monday night. A crowd of about 50 community members filled the high school’s library for a meeting that lasted a little less than 90 minutes. Keene, who recently finished his third season as varsity head coach, was told at his annual end-of-season evaluation meeting by athletic director Marc Keller that he would not be rehired. Before opening the floor for questions from the crowd, which included parents, high school and middle school basketball players and school board members, Keller said he could not reveal the reasons for Keene’s dismissal. After a little less than an hour of questions and comments to Keller, some of the gathering asked Keene to speak. “It means a lot to me. It means a lot to Mallory (Bonnevie, his wife). This is where we want to be,” he said. Keene said no positive points of his coaching were discussed during his evaluation with Keller, and that some of the reasons for his termination had not been discussed prior to the evaluation. He said the reasons sited for his firing included holding a practice on a snow day during the season, his sideline conduct, dwindling numbers in the basketball program, acquiring his required CPR certification late and allowing his team to wear warm-up shirts that displayed a company logo, which he said he was told was not allowed by the Maine Principals’ Association. Keene said he honored administrators’ request not to allow the shirts initially and did not allow them “until we were told that we could,” he said. Technical fouls were also an issue cited, according to Keene. Keene admitted holding an optional practice on a snow day at the Area Youth Sports gym in Livermore Falls. School regulations do not permit coaches holding practices on snow days on school grounds. The AYS building is the former Livermore Falls Middle School but is no longer owned by the school district. “I do not agree with that one bit. I think the (school) policies don’t allow numbers to be as high as they could be,” he said. Regarding the CPR certification, Keene said assistant coach Rachael Mastine was certified before the start of the season. After some confusion, he got his certification on Dec. 16, about a week into the regular season, “but if that’s fireable, I shouldn’t have been coaching up to that point to begin with,” he said. Spruce Mountain went 24-33 during Keene’s three years at the helm, reaching the Class B South quarterfinals in 2018 and preliminary round in 2019.
was unfair to blame him for low numbers when athletic programs across the state and across sports are facing the same problem. Junior guard Jaycee Cole said she and other players would not play basketball next year if Keene is not reinstated. “I think you’re not going to find a better coach,” she said. Auriana Armandi, a sophomore guard who played for Keene, said she wouldn’t feel comfortable with another coach next season. 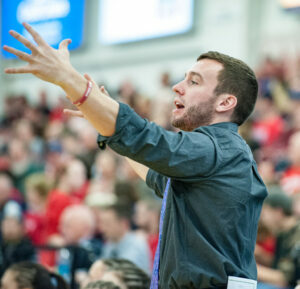 Travis White of Livermore Falls called Keene a “rising star” in the coaching ranks and said his firing is the latest example of administration not backing their coaches. Keller said he met with principal TJ Plourde after his evaluation with Keene and that Plourde, who was not at Monday night’s meeting, agreed with his decision to not re-hire Keene. Keller said Plourde also told him to discuss the decision with RSU 73 interim superintendent Robert Webster, but that Webster did not have to give his consent. Some asked Keller what the next step is to get Keene reinstated. “No decision will be made tonight,” he added.